Rendering by MPL Construction / The first of two new commercial buildings is set to open this summer at the Jordan Crossing development at Exit 1 off I-75 in East Ridge. It's slated to hold a Buddy's Bar-B-Q restaurant and Noire nail salon. Rendering by MPL Construction / A standalone, 2,000-square-foot Starbucks will go up next to an existing Chick-fil-A restaurant at the Jordan Crossing development. Jordan Crossing sits in East Ridge’s Border Region District, a 940-acre tract designed to encourage commercial development by offering incentives to builders. 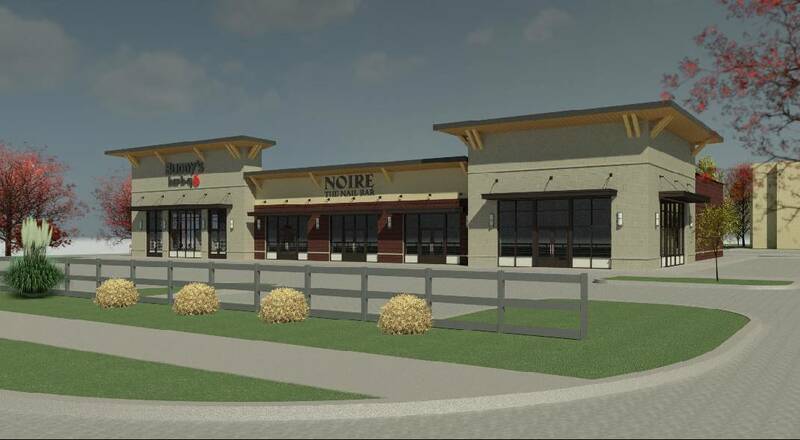 A pair of restaurants, including a Starbucks, are part of more commercial space set for the Jordan Crossing development in East Ridge in up to $5 million in new projects. The 2,000-square-foot Starbucks will sit adjacent to the existing Chick-fil-A restaurant, said John Healy, a principal in the company putting up the development at Exit 1 off Interstate-75 that already holds Bass Pro Shops. Also, a Buddy's Bar-B-Q eatery is included in the first of two more buildings going up at the development which will hold a total of 18,000 square feet of space in The Plaza Shops at Jordan Crossing. The Starbucks and the first building of The Plaza Shops, which also will include the nail salon Noire, are to open this summer, Healy said. Work on the second building will start about that time, he said. Healy said he's pleased with the roll out of Jordan Crossing, which also holds a new Hampton Inn. "We'd love for it to go faster. Now all the infrastructure is in and the new interchange is open," said the principal in the firm Wolftever Development. Healy said he believes the Chattanooga Red Wolves soccer club is still talking with East Ridge officials about potentially opening practice facilities at nearby Camp Jordan. "We're a cheerleader for any improvement that can be made," Healy said. "Camp Jordan is a huge draw for our region." East Ridge Mayor Brian Williams said Jordan Crossing has already generated millions of dollars in tax revenue. "A new restaurant and upscale retail options will continue generating growth in the area," he said. "In addition, Starbucks presents a lucrative opportunity for East Ridge to generate revenue from the thousands of travelers who pass our exit each day. We're thrilled to continue our partnership with Wolftever Development." Jordan Crossing sits in East Ridge's Border Region District. That 940-acre district around Exit 1 and Ringgold Road is designed to encourage commercial development by offering incentives to builders. In addition to Jordan Crossing, a different Chattanooga developer has plans for a proposed indoor water park and hotel nearby. Roshan Amin, chief executive officer of the Dynamic Group, has said his group is ready to move ahead with the $27 million project that includes a TownePlace Suites by Marriott at Ringgold and Frawley roads, just east of I-75. Amin said the hotel and water park will create $10 million in taxable gross revenue annually. In addition, East Ridge officials have acted to permit the Birmingham, Alabama-based restaurant chain Jack's Family Restaurant to take advantage of the district business incentive if it opens a new eatery at 4209 Ringgold Road.